I am specifically looking for a word to describe someone who works from home full time. The idea is a word (or short phrase) that means: "an individual who routinely works a full time job as part of a larger company, but who does so all or most of the time from a home office." In particular, I wonder if there is such a word or phrase that specifically includes the word home or a derivation of that word? 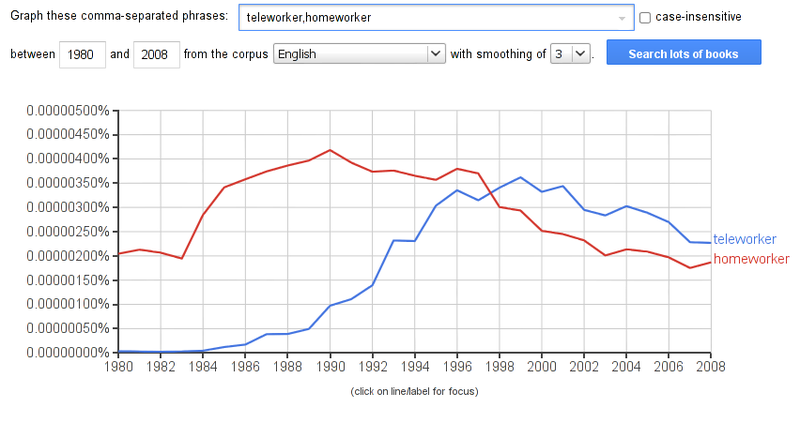 telecommuter: This is the closest example I've come across, but as I understand the word, it implies that the worker is not working from home on a regular basis (i.e. the worker also works out of the office a significant portion of time). It also, in my mind, doesn't necessarily imply that one is working from "home"; one could just as easily telecommute from a coffee shop or a park bench. I should acknowledge that my impression of the meaning of telecommuter does not appear to jive with the definition available at The Free Dictionary. The definition at Wiktionary does a better job of approximating my personal understanding. Does anyone else agree with my assumption that telecommuting is inherently less than full time? freelancer: May apply to some people who work from home full time, but not all people who work from home are freelancers (see the part of the requested definition about it being full time work for a company), and not all freelancers work from home. self-employed: This term implies that one is one's own boss, i.e. that the worker is not employed by a larger company/organization. I'm looking for the concept of working for a company but doing so out of your own home instead of at the company's office location (if it even has one). I suppose a self-employed person who works from home could possibly be a subset of the term I'm looking for, but the concept I'm trying to get at is at best a superset of this definition, and perhaps even different altogether (this is why, for now, I'm including "part of a larger company" in my idealized definition, above). someone who works from home, and communicates with their employer, customers etc using a computer, telephone etc. We are looking for an experienced seamstress to become part of our London team. Candidates must be able to work from home with their own equipment. Telecommuting, remote work, or telework is a work arrangement in which employees do not commute to a central place of work. A person who telecommutes is known as a "telecommuter"
are defined by the International Labour Organization as people working from their homes or from other premises of their choosing other than the workplace, for payment, which results of a product or service specified by the employer. There are an estimated 300 million homeworkers in the world, though because these workers generally function in the informal economy, and are seldom registered and often not contracted, exact numbers are difficult to come by. Recently, the phenomenon of homework has grown with increased communication technology, as well as changes in supply chains, particularly the development of Just In Time inventory systems. Under the Fair Labor Standards Act, homeworkers are entitled to the same protections of the law as other employees. Any violations committed with respect to homeworkers are subject to the penalties set forth in the law and in Regulations, 29 C.F.R. Parts 530 and 579. Homeworkers must be paid at a rate of not less than the minimum wage provided in the Act for all hours worked unless a lower rate is permitted under a special certificate for an individual homeworker in accordance with Regulations, 29 C.F.R. Part 525. I think the only valid answer is "No", there is no specific term as you define it. I think the difficulty is that in looking for a term to describe someone working full-time for a company from home you're also stepping into territory where people do exactly the same work on contract or connected directly with customers. Note that although the question and most of the answers imply modern, computer-based work what you've described isn't modern or computerised. Before the internet jobs such as typing and dressmaking were jobs routinely carried out by people at home (historically usually women caring for children but not exclusively). Telephone work, either cold calling or responding to support calls, can also be done from any home with a phone. Complicating this is that the definition given describes people working in cottage industries. In many of these industries they're just called "workers" because that's how all of the work is done - the central office is just a coordinating and warehousing facility. Searching this path might turn up a specialist term but I couldn't find one. I think the terms you've excluded are all there is (adding "remote worker" as a synonym and therefore also excluded). Edit: I like the answers by both Stefan and Elian as they're not just synonyms of the excluded terms. There is hope yet for this question. I guess "home-based employee" (or "home-based worker") would be phrase you are looking for? At my company this is simply referred to as a distance worker. It sounds like corporate crap but is what it is. "Remote and stay-at-home" worker or "Remote worker" could be considered. In the linked article, the writer used "remote and stay-at-home workers" first and continued with "remote workers". Ther verb "to work remotely" is braodly used to mean "to work away from his employer workplace". The link clearly defines what "remote work" is. Remote work is labeled many ways. We define it as work completed in an environment other than the employer workplace. This can include working from a home office for employees & contractors and/or working from any other imaginable environment (hotel, beach, in transit, etc.). Remote work is a fast growing trend in the workplace with 3 out of 5 North American workers stating they can work remotely. (1) Outworkers: Outworkers are contractors or employees who perform their work at home or at a place that wouldn’t normally be thought of as a business premises. (2) Home Based Business Owners: If they are running their own business out of their home. (3) E Worker: People who generally do data entry jobs from home. What do you call someone who works on requests? What do you call a provider who works on a offshore outsourced project? Is there an expression to describe someone with a special ability who chooses not to use it?